Consumers are getting in tune with streaming music, but the artists who produce the tunes are growing louder in their complaints about the music services. 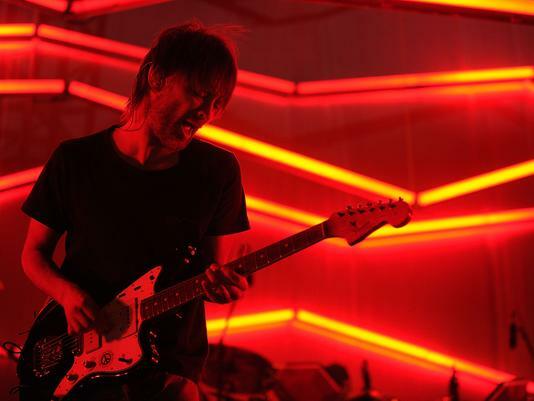 Most recently, Radiohead lead singer Thom Yorke struck a defiant chord when he and collaborator Nigel Godrich pulled from Spotify the recent albumAmok from their side project band Atoms for Peace. Also removed: Yorke's 2006 solo album The Eraser. Last month, classic rockers Pink Floyd criticized Pandora for trying to persuade artists to support reduced royalty rates on the Internet radio service. It's the second shot taken recently at Pandora. Last month, David Lowery griped the servicewas paying him only $16.89 in the first quarter of 2013, during which a song he co-wrote was played more than 1.1 million times. Lowery co-wrote the songLow with two other members of the band Cracker, for their platinum 1992 album Kerosene Hat. Both services say that they're paying significant sums for music that is streamed. But for music lovers — many of whom have embraced streaming — sorting out the debate is no easy feat. Spotify and Pandora are different in that Spotify delivers on-demand tracks — for free with ads, and $9.99 monthly for ad-free listening on portable devices — while Pandora streams themed radio stations for free and premium subscriptions. Meanwhile, royalties can differ depending on whether an artist wrote or performed the song — or both — and what type of service the song is played on. Because the industry and the law treat different technologies differently, the royalty paid when the same song plays on terrestrial radio, satellite radio or on the Internet may vary. Pandora and Spotify pay different performance royalties because Pandora is a non-interactive service, in that you can't choose a song on-demand, as you can on Spotify. That just scratches the surface of the intricacies in the evolving digital music ecosystem. "What does it mean to own a piece of music in 2013? That is the question for copyright owners. Will people download to own, or will they simply pay for, or steal, access to music in the cloud?" says Shelly Palmer, author of Digital Wisdom: Thought Leadership for a Connected World. "Today, digital music rights fees (such as those paid by Pandora and Spotify) represent the lion's share of revenue that recorded music companies make." The artists charge companies are making millions by paying pennies to artists. "It's bad for new music," Godrich tweeted July 14. "It's an equation that just doesn't work." However, many music fans seem to like the medium. Digital music sales are estimated to make up a growing chunk of total music spending as it rises from about $7.2 billion in 2012 to $8.1 billion in 2017, according to estimates from Strategy Analytics. Despite download sales dominating the digital music store, streaming is steadily making up a larger percentage of digital music sales, rising from about 12.5% in 2012 to 15.8% in 2017. So Spotify, Pandora and other music services such as Rdio and Apple, which has a new iTunes Radio in the works, are trying to develop a successful business model. Spotify has 6 million paying customers and 24 million active users globally, the firm says. Online music tracker Eliot Van Buskirk at Evolver.fm estimated that Spotify could soon take in $1 billion in revenue annually. At Pandora, even though it grew listenership to more than 200 million U.S. registered users, the publicly traded company lost $38 million during the fiscal year that ended in March. The surviving members of Pink Floyd — David Gilmour, Nick Mason and Roger Waters — noted that Pandora raised $235 million in its 2011 initial public offering, in the band's June 23 editorial on USATODAY.com. "Nearly 90% of the artists who get a check for digital play receive less than $5,000 a year," they wrote. "Everyone deserves the right to be paid a fair market rate for their work, regardless of what their work entails." Pink Floyd also charged Pandora founder Tim Westergren with deceiving artists by urging them to sign a "letter of support" for Internet radio that actually would cut Pandora's royalty rates. Westergren countered by saying that Internet radio is threatened by a convoluted and unbalanced royalty-setting process that can include individual deals between labels and broadcasters. Pandora might only pay $1,370 in royalties for a million spins of a song, he says, but each spin may be only heard by one person. Meanwhile, if that same song is played on a popular FM station, thousands, even millions, could hear it. "If major market FM stations paid the same rates as Pandora, based on audience, some would be paying thousands of dollars for every song they played," Westergren wrote in a blog post. "How much do they pay performers right now? Zero." Similarly, Spotify CEO Daniel Ek noted on Twitter that "we're paying out more than $500 (million) this year. That's real money." Pandora plans to continue to push for Congress to pass a bill enacting lower royalty rates. Meanwhile, music services, labels, publishers and artists will hash it out. "We're dealing with antiquated laws for different types of music that don't quite make sense any more," says Paul Resnikoff, publisher of DigitalMusicNews.com. "It is so complex (because) it has to do with antiquated rules that never quite got revised, and everyone has piece of the pie, and they are going to protect that piece of the pie." Among the oddities in these streaming showdowns are that Yorke and Godrich, the longtime producer for Radiohead, were able to get their music pulled from Spotify. But Radiohead's catalog, which is owned by Warner Music, remains on Spotify and other music services. And Atoms for Peace plans to make its live performances Thursday and Friday available on video site Soundhalo.com. Pandora continues to offer a "Pink Floyd" radio station that includes the band's songs such as Another Brick in the Wall, Pt. 2 followed by tracks from other bands such as Dire Straits and Led Zeppelin. The digital music evolution has become "a paradox," says Resnikoff, "in which consumers have about 100 times more enjoyment and access than they have ever had, but the only problem is that the value of those plays ... (what) goes back to artists has decreased. That causes all sorts of problems."